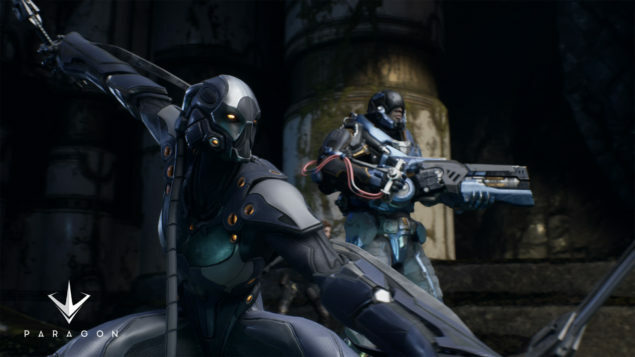 Epic Games is crashing the MOBA genre on its own terms with Paragon. Revealed during the PlayStation Experience 2015 in San Francisco, the game is headed to both PC and PlayStation 4 with full CrossPlay enabled between the platforms. The current plan is to allow paid Early Access from Spring 2016, with a free Open Beta (the game will be Free to Play) in Summer 2016; there have been a number of Online Tests on PC already, with PS4 testing due to begin soon. Straight from the announcement, Epic highlighted that Paragon will allow “direct control of the action” as opposed to other MOBA titles. We’ve managed to talk with Creative Director Steve Superville about this, as well as other details of Paragon (embedded just below is the latest video on Kallari’s abilities, by the way). What can you tell us about the backstory of the world Paragon is set into? We’re not quite ready to talk about this in depth. It’s important for players to care about the Heroes and the world, so we’ll certainly have more to share in the future. Right now, it’s fun to watch people speculate. The Agora map showcased so far seems to draw from both fantasy and sci-fi elements for its aesthetics. Is that the look you’re going for Paragon as a whole or will we see very different looking maps, too? Internally, we have referred to Paragon as being set in a “science fantasy” world, so I’m glad you picked up on that! We plan to have varied, interesting Heroes, and our plan right now is to stay rooted in that science fantasy aesthetic. Do you already have an approximate number you can share regarding available maps at launch? We’re starting off with the classic MOBA arena, with the three lanes, the jungles. We’re initially focusing on that as we balance and get player feedback. Will there be any destructible terrain on the maps, such as cover? Destructible terrain and cover isn’t a part of Paragon’s gameplay. Do you intend to allow aesthetic customization of Heroes in Paragon? Right now, we’re talking about offering various skins to let players customize their Heroes. Can you explain how the action/TPS element shakes up the overarching MOBA design in your vision for Paragon? Part of action/third-person gaming is gaming is really about being in the middle of the combat, being up close, feeling like you’re actually on the battlefield. By giving players total third-person control and putting them directly in the fight, there’s an immediate connection and sense of weight that’s added to the experience that you don’t always get with top-down, point and click action. We’re also adding verticality to the experience, so you can aim up at an enemy perched high or surprise a team from above; we’ve built the arena with peaks and valleys to take advantage of this. We hope that when people get their hands on Paragon that they’ll be able to appreciate how this changes things up. How many of the cards will be active rather than passive, in percentage? We’re still working on balancing the mix right now, so it’s hard to say at the moment. Are you experimenting with additional modes or will it be just destroying the enemy team’s core? Right now we’re focused on the traditional mode. One thing at a time! Do you plan to integrate clan support for matchmaking, tournaments/leagues etc. at some point? Our goal is to make a fun competitive experience, and we’ll do what we need to in order to support the community’s needs. Once we get people in and playing, we’ll see what they want and need, and start building to support that. About matchmaking, any game is more fun when you’re matched up against players of similar skill levels; we’ve already implemented an early version of skill-based matchmaking in our Online Tests! You’ve mentioned that you’re targeting 60FPS on PlayStation 4. Do you intend to drop graphics fidelity to do that if necessary, including resolution? I’ll say that Paragon is going to look awesome on whatever platform you decide to play on. It’s already looking great on both PC and PS4, and it’s going to get better as we get closer to a more public release. PC/PS4 crossplay is certainly one of the most interesting features of the game. Will it be possible to create a party with a friend playing on the other platform, in order to join a match on the same team? Also, other crossplay enabled games (like Rocket League) allow users to optionally remove the other platform from the matchmaking pool. Where do you stand on this topic? We’re excited to support crossplay, because it’s going to grow the pool of potential players at any given time, and that’ll help us foster and grow an active community. We’ll have more details on how that’ll work soon; we’re still working through the specifics. Many people are skeptical about controller standing a chance against keyboard&mouse. Can you explain why there won’t be a difference in Paragon? The pace of Paragon is not frantic like a typical third-person action shooter, and that’s intentional. We want to give players room to think strategically, to be careful about how they play, and to understand the action as it happens. In Paragon, it’s not entirely about twitch-based controls or that no-scope sniper headshot, so that levels the field a bit to start. And of course, the goal is to tune the controls in such a way that you should see no discernable difference — a skilled player on a controller will be able to hold her own against a skilled player using a keyboard/mouse. Some of our top players internally are using controllers against others who are using keyboard/mouse. While reading the Paragon subreddit, I noticed that more than a few requests to bring the game on Xbox One popped up. Is that something you might consider at some point in the future (even though that would mean a separate playerbase, like in Rocket League, due to Microsoft’s policy), or are you set for good on releasing the game just on PC & PlayStation 4? Right now we’re just talking about Paragon for PC and PlayStation 4.